These train cases come in 3 different sizes: small, medium, and large. Each case features a zipper on the exterior, and several pockets and compartments on the inside. Add some optional piping to give your case an extra bit of attention! 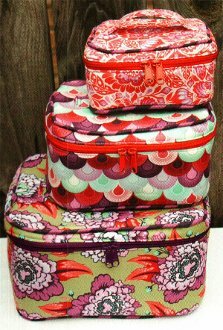 Perfect for make-up, sewing supplies, or other small findings, this is the perfect case to grab and go!